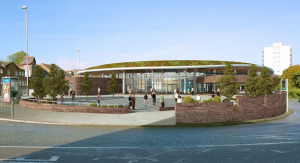 Following a competitive procurement exercise John Graham Construction was appointed in July 2015 as the construction contractor for the new Chester Bus Interchange and the associated public realm works on Gorse Stacks and Brookdale Place. Work began on site on 21st September 2015 following the indefinite closure of Gorse Stacks short stay car park on 31st August 2015. Car park users are being directed to use alternative locations at the new underground car park in Delamere Street which has 351 spaces and the Brook Street car park (accessed from St. Anne Street). Blue badge parking remains available in Kaleyards. In November, the site boundary was extended out to the middle of Gorse Stacks when the road was narrowed from two lanes from the previous four becoming a one way street navigable in an eastbound direction for the duration of the construction period. Bus services using Gorse Stacks are being diverted along the inner ring road and are able to enter Frodsham Street via Hoole Way roundabout. The construction programme is expected to last up to 15 months concluding at the end of November 2016 with the new Bus Interchange opening for operational service in early 2017. A second phase of traffic management began in Spring 2016 when public realm improvement works commenced on Frodsham Street, and detailed briefings of the changes were provided to the public in advance of their implementation.